They’re a fixture on street corners and shopping strips right around our country. Now you can put an iconic red Aussie post box slap in the middle of your play room. This wooden post box beauty is the latest toy from the marvellous minds over at Make Me Iconic, who have won fans all the way from Kununurra to Dover with their quirky reinterpretations of iconic Australian bits and bobs into covetable toys and homewares. 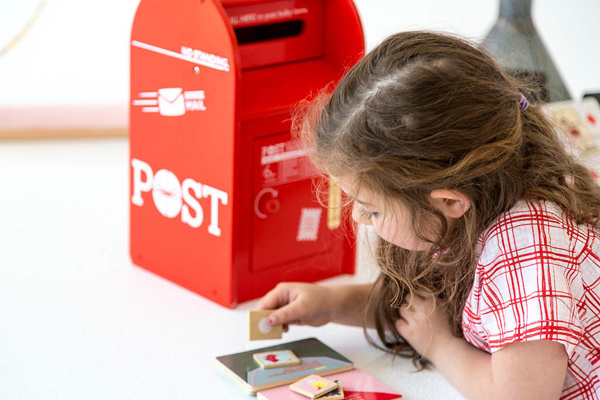 The Iconic post box, a toy replica of the familiar Australia Post boxes we all know and love, is as cute as hell, which is pretty much what we’ve come to expect from Make Me Iconic (remember their OMG adorable toy tram and wooden biscuits). Good looks aside, imagine the fun your kids will have with this – the possibilities for play are endless. 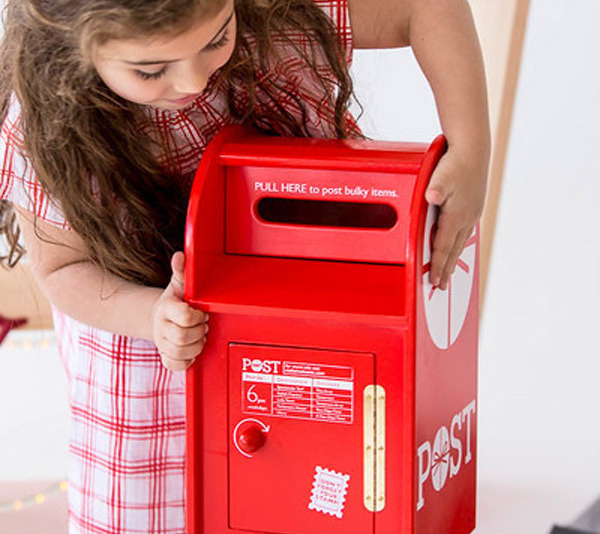 The slot pulls down to post letters, just like the real thing, and kids can open the hinged door to retrieve their letters and parcels. 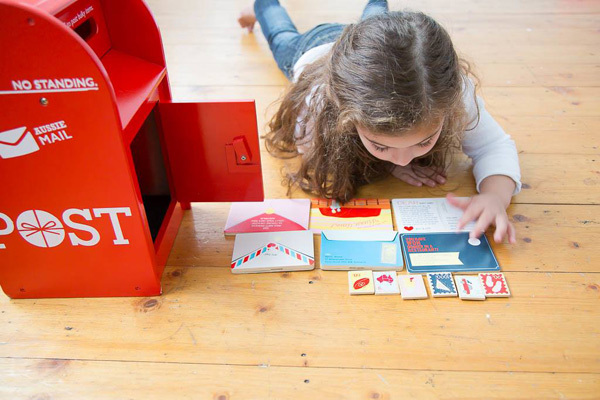 They can post letters to – and receive letters from – siblings, mum and dad, their favourite toys… not to mention the potential for all manner of fun correspondence that may appear from the Tooth Fairy, Santa and any number of other fairies that happen to live at the bottom of your garden. Kids love getting mail, but let’s face it, these days most mail comes electronically. There’s quite a lot of retro charm about receiving a real letter with real handwriting or drawings on real paper. 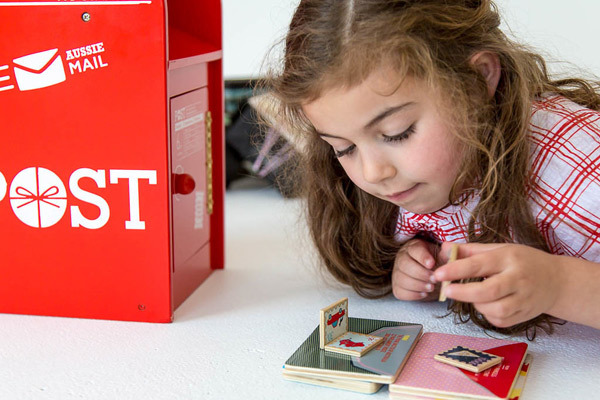 The Iconic post box comes with six wooden stamps that can be attached to six wooden letters and postcards via velcro for very little ones. It costs $70 from Make Me Iconic, who are expecting new stock to arrive very soon. If you cannot wait and simply must have one today, you’ll find the Iconic post box in stock online at Museum Victoria. While you’re waiting for the postie to deliver your new post box, take the time to browse our previous posts of Make Me Iconic delights. We can’t wait to see what their design folk come up with next.